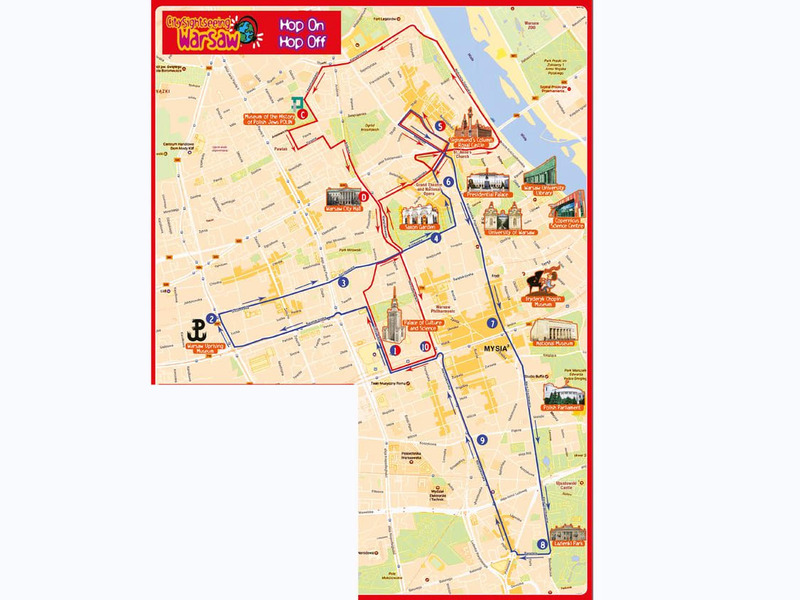 Explore Warsaw at your own leisure with your hop-on hop-off sightseeing ticket! Choose between a 24, 48, or a 72-hour ticket, create your own itinerary and visit as many sites as you can! • The Blue and Red bus routes will not stop at Old Town temporarily due to lack of accessibility. The routes will stop at Pilsudski Square instead. • The Blue bus route will make an additional stop at Warsaw University (Monday to Friday only). All changes apply until further notice. Discover Warsaw, the city of contrasts, where historical monuments and modern architecture coexist in every street with this convenient 24-hour hop-on hop-off bus tour! Explore the Old Town, the Barbican, Lazienki Park, Place of Culture and Science and more! Click on the picture to enlarge and see the detailed map. Discover Warsaw, the city of contrasts, where historical monuments and modern architecture coexist in every street with this convenient 48-hour hop-on hop-off bus tour! Explore the Old Town, the Barbican, Lazienki Park, Place of Culture and Science and more! Discover Warsaw, the city of contrasts, where historical monuments and modern architecture coexist in every street with this convenient 72-hour hop-on hop-off bus tour! Explore the Old Town, the Barbican, Lazienki Park, Place of Culture and Science and more! The on-board bus audio guide is available in the following languages: Polish, English, German, Russian, Chinese, Japanese, Hebrew, Italian and Spanish. The on-board bus audio guide also offers Polish commentary for kids.